Hard Maple, also known as Sugar Maple, grown in Canada and the USA, is a pale reddish brown to a light tan. Typically Hard Maple has a straight grain. 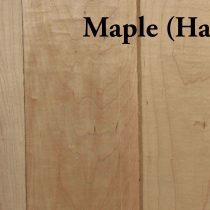 Because of its hardness, Hard Maple is used for cutting blocks and flooring in bowling alleys and roller skating rinks.